Pass by this house. Enjoy how it is sited between its fields on the left that slope down across the flood plain to the river, and the road and the hill to the right. It seems abandoned - although someone carefully closed the shutters on a second floor window. 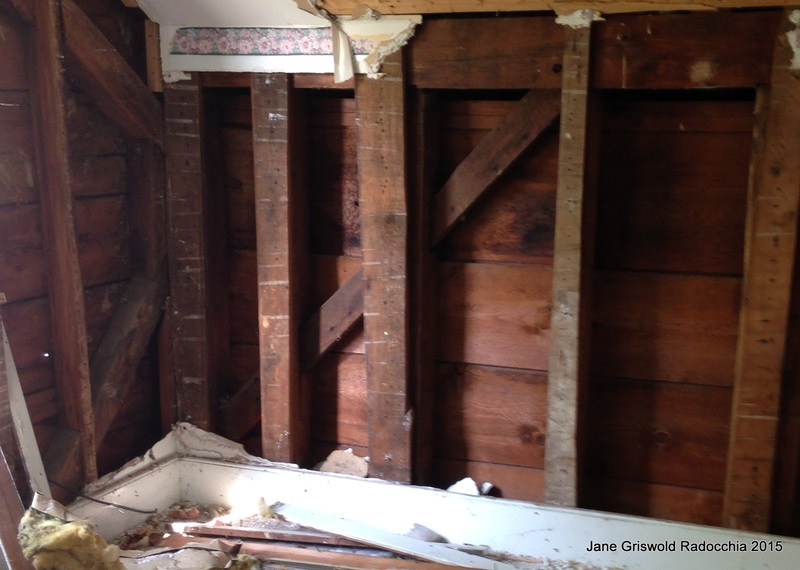 The broken dormer says there once was a wing - or the earlier house. Set into the hill below the wind. The old house, a story and a half cape set lower on the land, would have had easy access to the farmyard and the fields. It faced south to the sun, watching the traveler approach. The new wing is set higher, more worldly and 'speaks' to the road instead. Please click to enlarge the photograph see the lovely curved details of the architrave. And rotted wood for plinth blocks/bases. with its original casings, doors, newel, and mantle. The shape is simple: 18 ft wide by 36 ft.long. 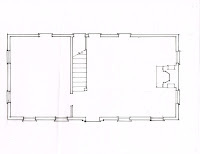 2 rooms each floor. 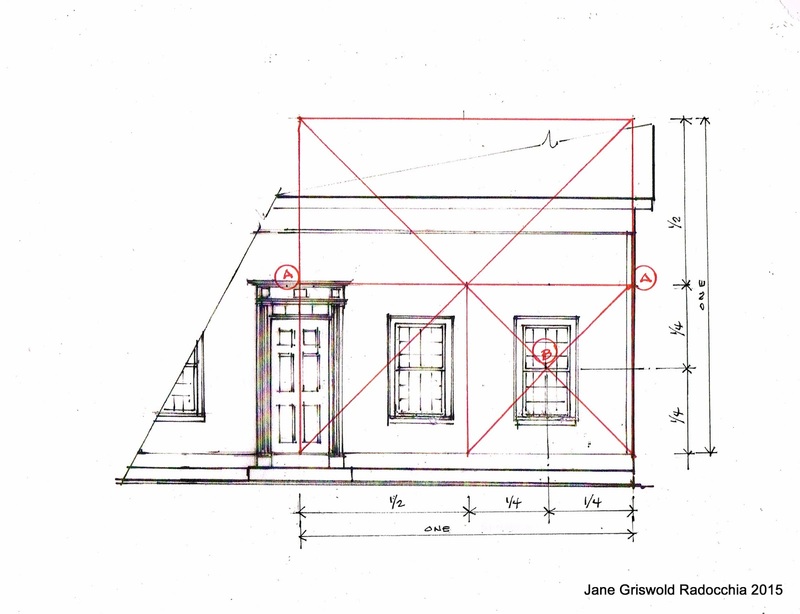 I thought of Owen Biddle's plan for a 'small house'. * That plan used 2 squares divided into 4 parts. Would squares divided in half work here? Or would I find Asher Benjamin's use of squares divided in thirds? Owen Biddle's simple division of the square works here. The plan is 2 squares. 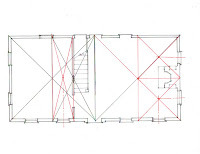 The interior wall at the stair is located at the 3/4 mark of the left square. The windows are placed on the centers of division of the original square . Those on either side of the fireplace are easy to read:half the big square divided into 2 little squares. 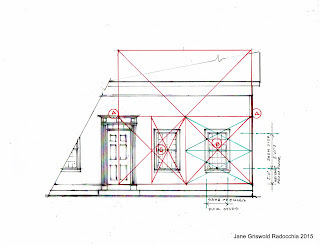 The windows beside the front door are centered on rectangles that are 1/4 of the large squares. 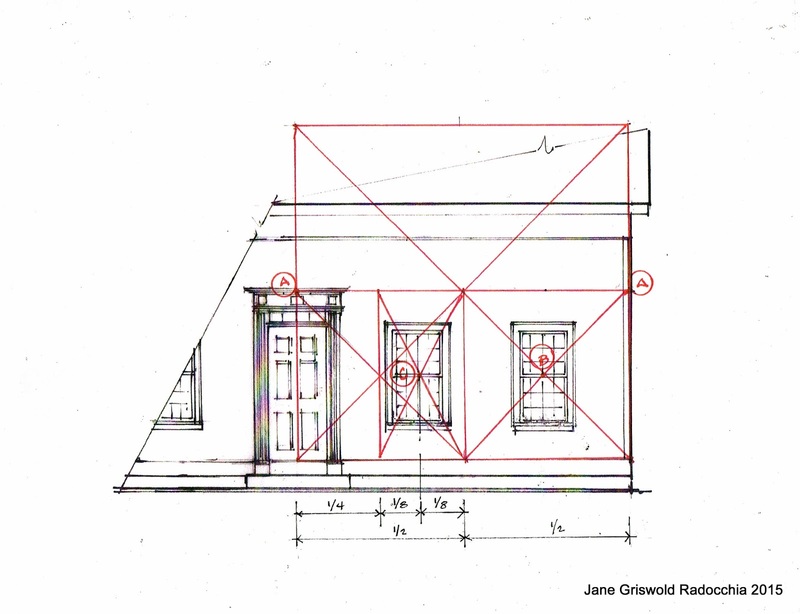 The cross section of the house follows the same pattern. 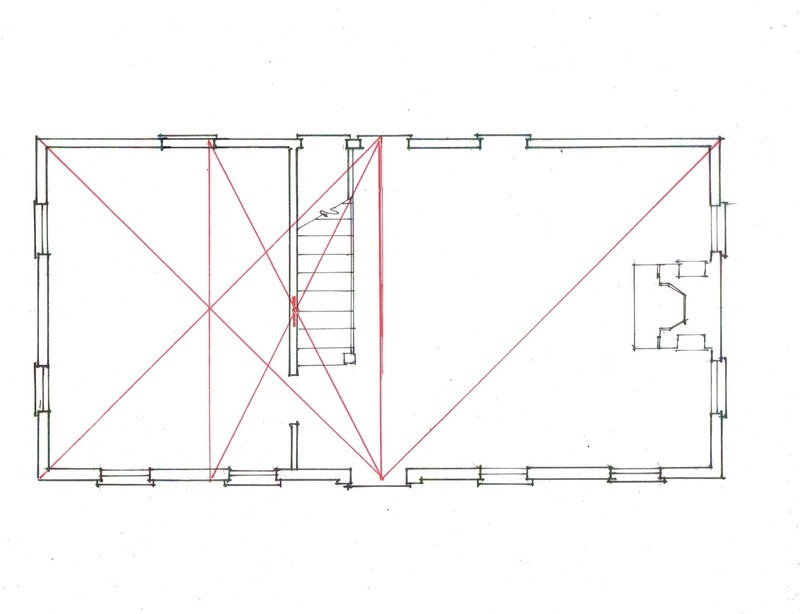 The first floor volume is 2 squares long and half a square high. 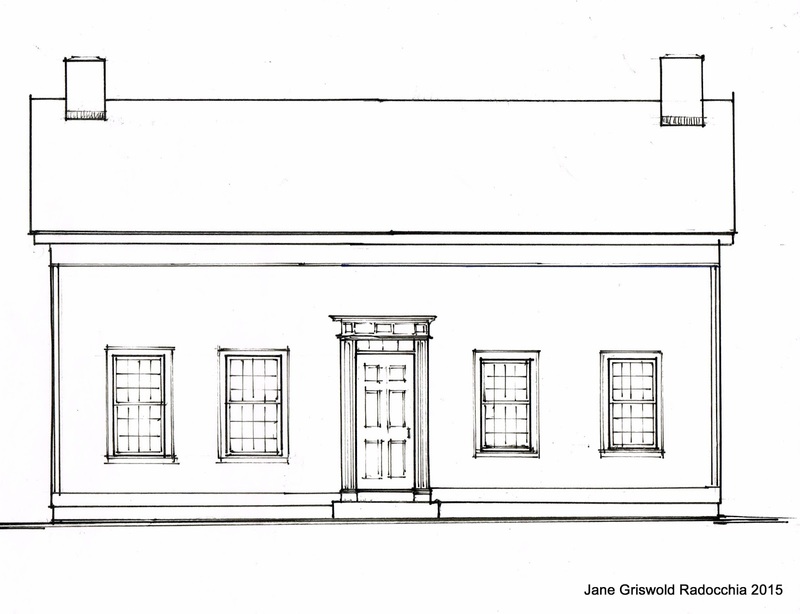 The height of the exterior front and rear walls is 3/4 of the square. 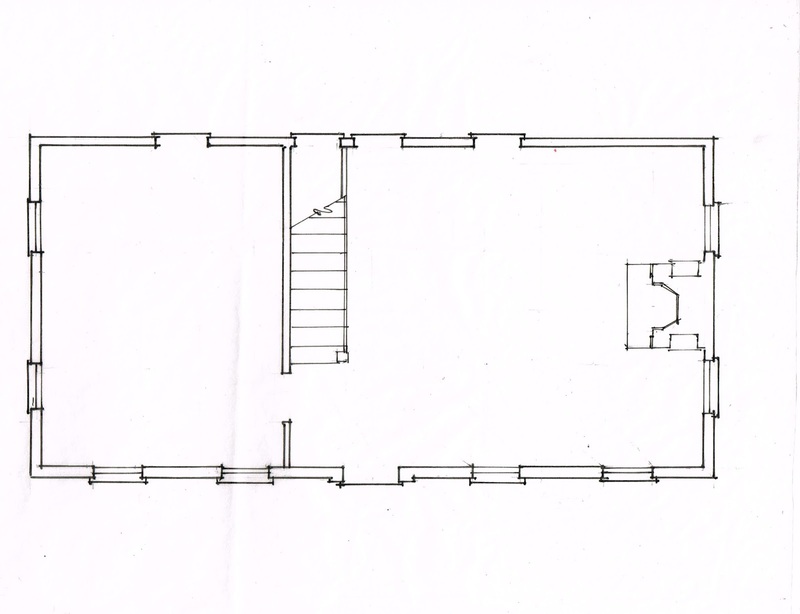 The second floor height is 3/8 of the height of the square. 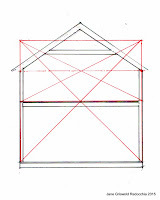 The division of the basic 18' x 18' square into smaller parts is done by diagonals. It is visual. No one needed to write down fractions. 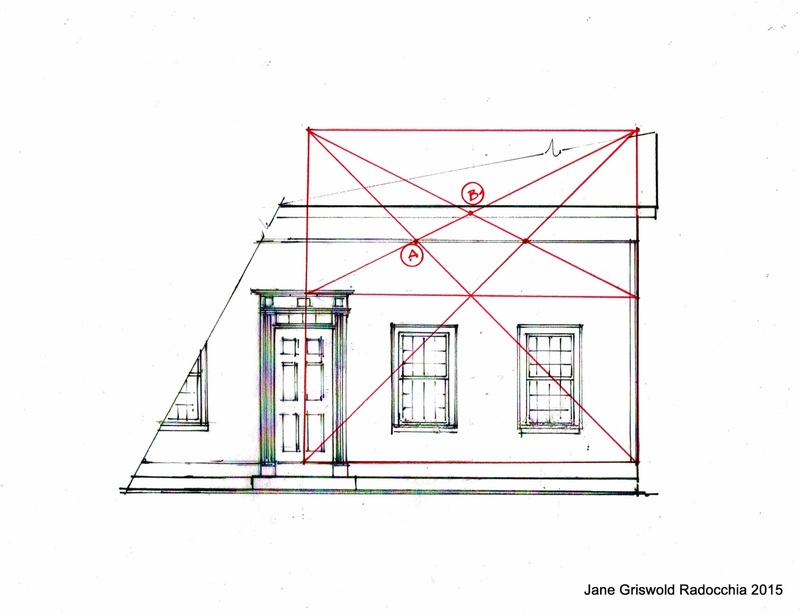 The sadly sized windows - replacements when repair of original windows could have saved them - have mismatched clapboard above the lintel which outline the size of the original sash. 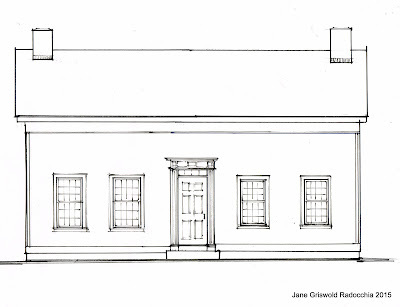 Here is my drawing of the front of the house with its original sash. I do like this house! 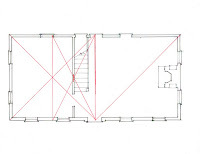 The geometry follows that of the floor plan - the square divided into its integral squares and rectangles. 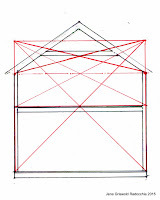 The intersections of the diagonals give the dimensions. 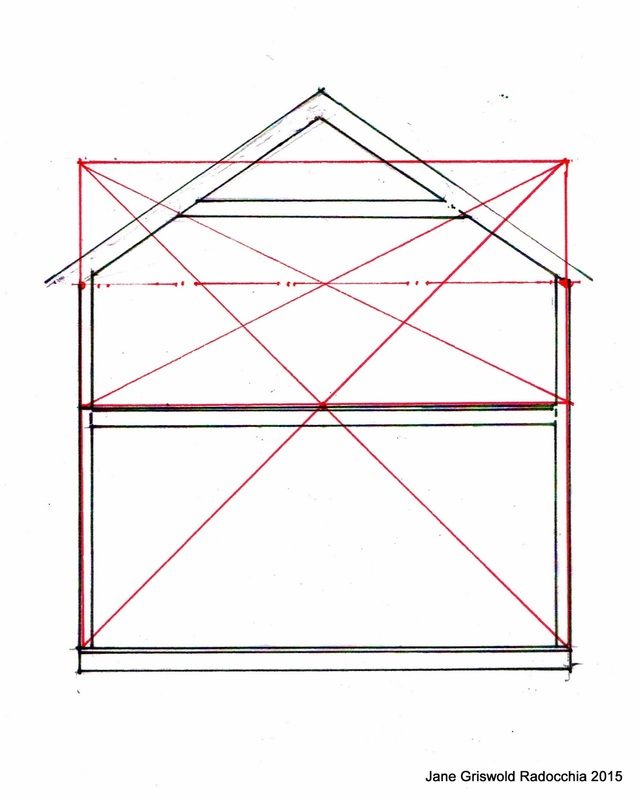 The right hand square of the house is drawn. The center line (A - A dividing the square into 2 equal rectangles) marks the top of the entrance - probably the framed opening, not the casing. 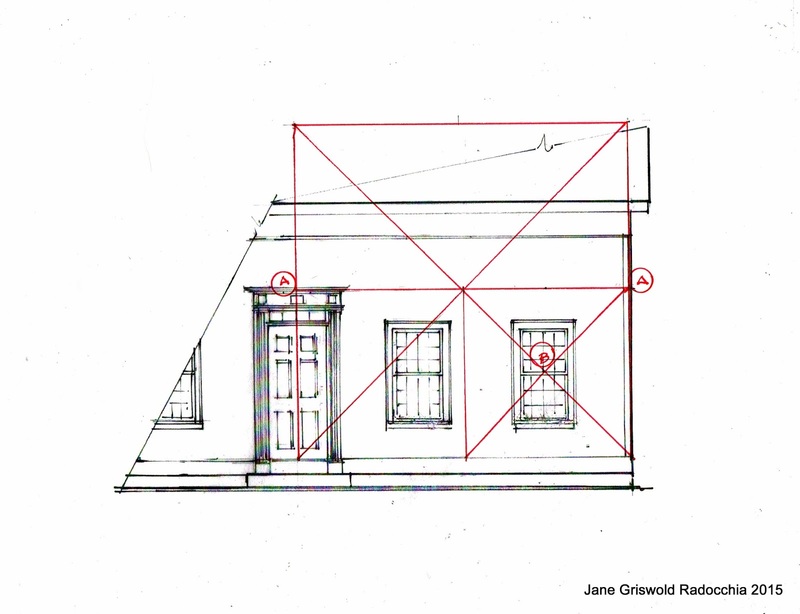 The right window (B) is centered on the small right square which is 1/4 of the large square or at the 1/4 mark of the right side of the house. I think about this in 'geometry', but it is hard to show when I can't use my hands. Thus I am adding the fractions. 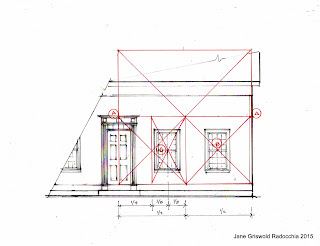 The left window (C) is centered on the half of the small left square, just as in the floor plan or at the 5/8 point. 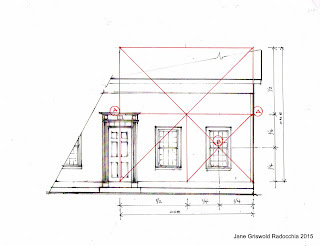 The size of the window and where it fits in the wall is also determined by the intersections of the diagonals of the square and its parts. Here the right hand square is divided into 2 equal rectangles. 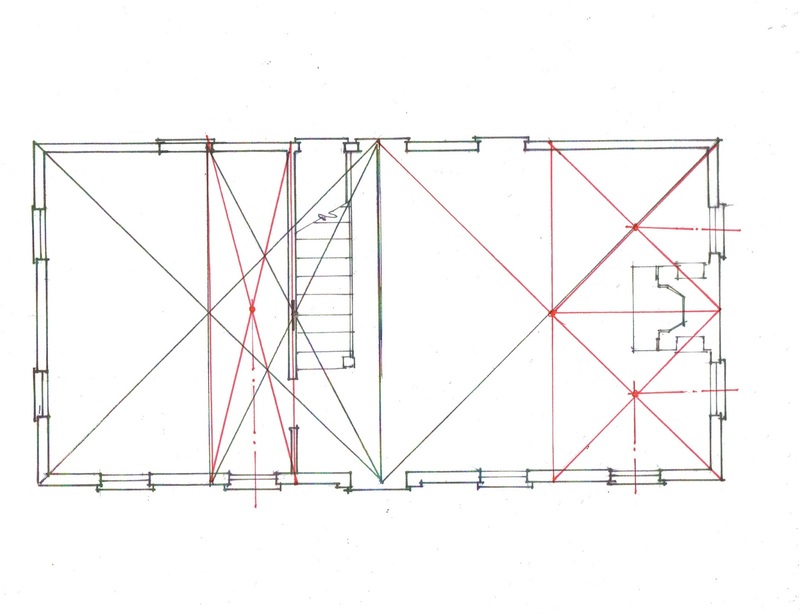 I have drawn the lines in green and added emphasis at the intersections. I measured the height of the front wall from the inside. I did not measure the eave overhang or the frieze. Here I have just laid out the diagonals of the upper half of the square to see what i might find. It looks like it might be right. 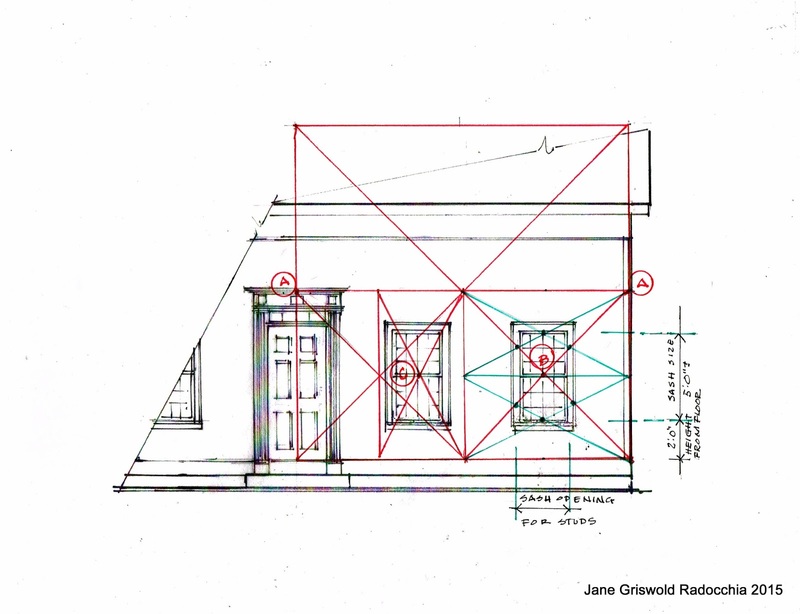 I will have real dimensions when the house is dismantled. I might be right, or learn something new. Here is the interior second floor corner where the frame is exposed. The posts which are visible are not regular in size. There is some interesting bracing. 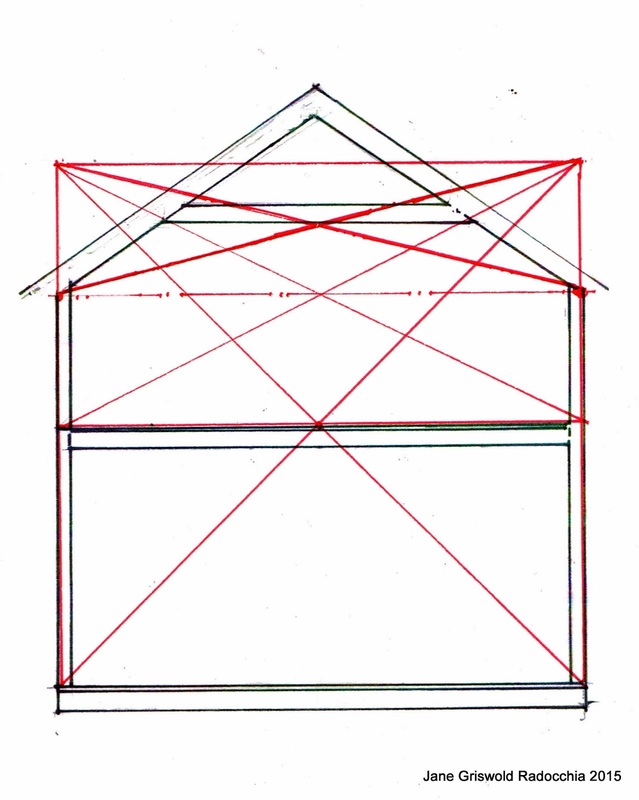 Does the frame also correspond to the rhythm of the square?